In optogenetics, researchers use light to control protein activity. 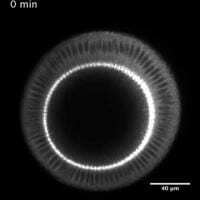 This technique allows them to alter the shape of embryonic tissue and to inhibit the development of abnormalities. Now, scientists in EMBL's De Renzis group have enhanced the technique to stop organ-shaping processes in fruit fly embryos. Their results, published in The EMBO Journal, allow control over a crucial step in embryonic development. For healthy development, tissue has to change its shape. For example, groups of cells alter their shape as part of the development of organs. Stefano De Renzis and his team members at EMBL are interested in the mechanisms behind these shape transitions and use optogenetics to steer them with light. To form internal organs like kidneys, groups of cells must move towards the inside of an embryo. During this process, called invagination, the surface of a group of cells contracts and causes the tissue to fold inwards. "Imagine the embryo as a balloon and tissue invagination as the deformation caused by fingers that push the surface of the balloon inwards. The only difference is that cells are not being subjected to an external force like the fingers, but need to be able to generate forces to move inside by themselves," says De Renzis, who led the project. Abnormalities in this process lead to problems in tissue and organ development. De Renzis and his group inhibit the naturally occurring invagination process to understand its driving factors. A crucial aspect is the flexibility of the part of the tissue's surface that folds inwards. When the scientists use optogenetics to stiffen this surface, it becomes impossible for cells to bend inwards, stopping the whole invagination process. "If cells are not allowed to relax their bases, they cannot constrict their apices efficiently, and tissue invagination stops. To stick with the balloon analogy, it's like when you squeeze the top and the bottom of a balloon simultaneously. The inner pressure becomes higher and the balloon can't fold inwards anymore," says De Renzis. With their new method, it is not only possible to stop invagination before it happens, but also to stop it mid-process. While scientists had speculated about the importance of the tissue's basal (inner) surface before, experimental techniques were not advanced enough to test this. With their new method, the EMBL team can modify protein activity without damaging the cells, while still being able to activate and deactivate the modifications as necessary. Their results provide the first proof for a long-standing theory that could explain morphological abnormalities during embryonic development. Combined with their previous results, the scientists are now able to control every step of this important developmental process in embryos. Although the experiments were done in fruit fly embryos, De Renzis expects the results and methods to be applicable in other organisms. Optogenetics could be used to create and shape artificial tissues or to control tissue development in regenerative medicine.